Question: What other input possibilities are available for my microprocessor? The cockroach can sense small changes in the air flowing around their bodies using 2 tiny organs on the posterior appendages called the “cerci”. The signals from these antennae like protrusions feed into 14 nerve cells that process this information and allow the cockroach to respond very quickly to any threat. 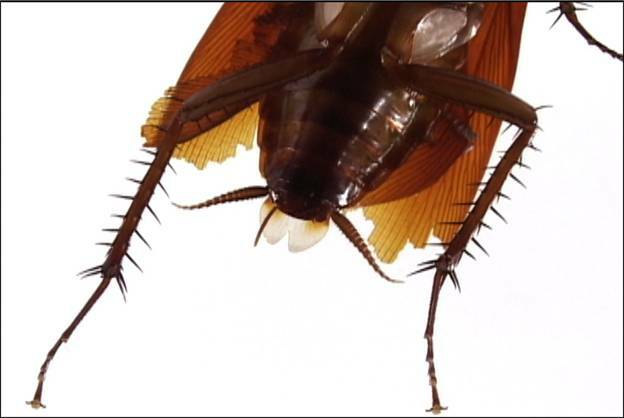 The cerci are connected directly to the legs and do not need to go to the brain first to have the cockroach move their legs instantly for escape. Additionally, the cockroach has 30,000 hairs on each leg also allowing sensitivity, which permits the cockroach to escape if one of the hairs is triggered. The end of a cockroach leg from the video "Squish" by Catherine Chalmers, 2003. Herein lies the challenge, which is to say achieving a density of sensors with the ability to channel and manage all the sensor data coming into your processor. The sensors you use for your project are going to be the eyes, ears, nose, and skin of your artwork/invention and you must think how to manage this data and the wiring challenges that can be presented. When selecting sensors for your project, consider if you want to use a simple digital switch, which will create an on or off signal such as a wall switch or will you be sensing something which changes over time as with the analog world. Analog vs. Digital. An analog sensor requires more processor time and continual processing. A digital on-off switch requires less processor time but does not allow you to tell as much about the world you are sensing. If you choose an analog sensor you will have to use an analog to digital converter in order change this continually changing data into digital signals that can be understood by your Basic Stamp, however, there are many ways to utilize the Basic Stamp without analog to digital converters and still have continuously changing signals. If you are using an Arduino then it has an analog to digital converter pin built in. For example, even a simple switch connected to a microprocessor can provide a myriad of behavior outputs. The first time a switch is pressed your system can do one thing and the next time it is pressed, it can do another. The repertoire of behavior that your program will execute and its diverse behaviors will be able to respond with a variety of sensors, which are chosen according to the environment being probed. Are you interested in sensing humans, fish, or some environmental thing? What is the bandwidth, or a number of samples do you need the system to take during a period of time? If it is humans, are they experienced with the use of that sensor? Does the work require a learning curve? Are you sensing movement? Are there sensors, which are optimized for what you are working to sense? Are the users experienced with the environment? Is it wet? Is it dry? Are you interested in touch? Should the sensor be able to act in a variety of ways? If you think of the simple light switch or push-button that is part of your daily existence and try and think back to you’re first encounter with a wall switch. It required that you made the association of switching it on and off and having the light respond. 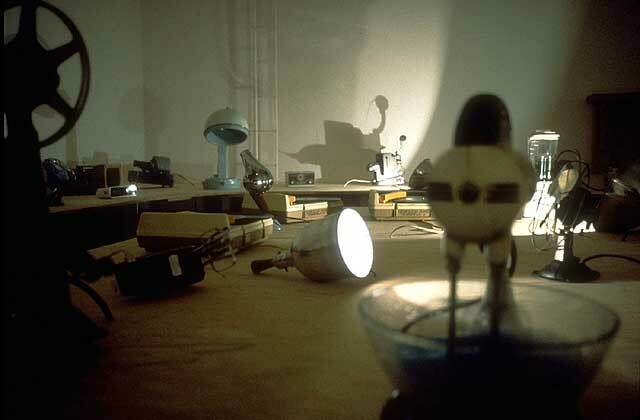 The artists Perry Hoberman has been very successful at using clear and often intuitive interfaces in creating rich interaction with a twist. 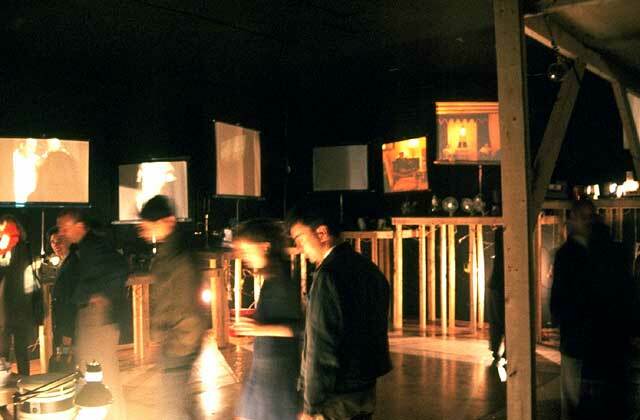 In his work Faraday's Garden 1990-99, Hoberman uses multi-switch pressure sensitive mats to activate a series of surplus machines on-off as viewer/participants navigate through space. Faradays Garden by Perry Hoberman. 1990-1999. The multiple footfalls from crowds streaming through this social space of appliance nostalgia works to create a wonderful sound and cultural cacophony as you move about the installation. The nostalgic beauty of these Goodwill finds is as a homage to Michael Faraday, the inventor of the AC motor, which powers most of these devices to whir, chop and spin. The sonic environment is wonderful. The interface for this work as direct pressure sensitive mats that would switch on the AC when you would pass. The simple and direct interface associated with the sound was most effective.